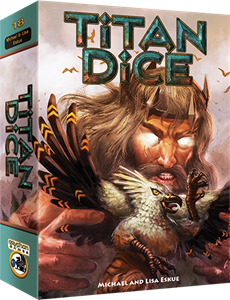 Announcing the newest release in the illustrious Gryphon Bookshelf Series, Titan Dice is a fast paced dice rolling game for the whole family! The Titans have been imprisoned for millennia, but now they have escaped! They are emboldened to overthrow the gods, but first they will need an army... Capturing mythical creatures to amass this army is the key to success. The Titan who captures the most creatures by the end of the game will be named the Lord of the Titans and have the honor to lead their glorious army into a mythic battle that will be remembered throughout the ages! The game's crowdfunding campaign on Kickstarter is at its final stage, so check it out!